How to use the fuel efficiency calculator? MPG calculator, otherwise known as the miles per gallon calculator, is a useful tool that allows you to calculate fuel consumption. When you plan a trip, you'll probably want to know how much it will cost. The fuel efficiency calculator will estimate it very quickly. Gas mileage is the relationship between the distance you've done and the amount of fuel which has been burnt. It's crucial to know the fuel consumption of your car. Otherwise, you will not be able to estimate how much petrol you need to cover a particular distance. If you're leasing a car, there's more to worry about than just the fuel efficiency - make sure to check what will be the payment for exceeding lease mileage! However, it's much easier to use the MPG calculator. The fuel efficiency calculator estimates gas mileage on the basis of the number of kilometers and the average fuel consumption of your car. 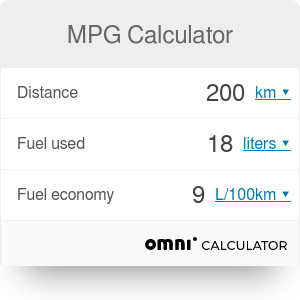 Then the MPG calculator will estimate the amount of fuel you will need for the whole route. The advanced version will determine the total cost of your tour as well. If you want to share the cost between a few people, you may find our gas estimator useful. This tool automatically divides the total cost between the number of people who are going to pay it. MPG Calculator can be embedded on your website to enrich the content you wrote and make it easier for your visitors to understand your message.